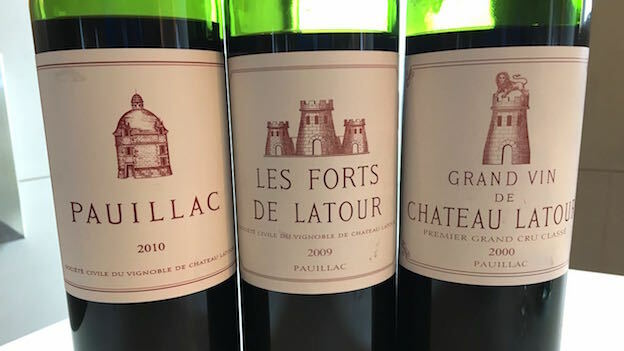 These are the latest releases from Château Latour. In 2011, Latour announced they would no longer sell wines en primeur, but would instead offer customers vintages the estate deemed ready to drink. I tasted these wines on visits to the château in July 2015 and April 2016. Latour's 2010 Pauillac is a huge overachiever and shows just how compelling this vintage is. The aromatics alone are beguiling, but it is the wine's impeccable balance and class that are most impressive today. Hints of leather, earthiness, tobacco, licorice and dark cherry are nicely layered into the silky finish. The 2010 is an absolutely delicious wine to drink now and over the next decade or so. 92/Drinking window: 2016-2026. The 2009 Les Forts de Latour shows the richness of the vintage in its dark, slightly roasted flavors. Ample and sumptuous in the glass, the 2009 drinks well now, but it also gives the impression of limited upside, so I would not hang on to it for more than a handful of years. Mocha, espresso, dark fruit and spices add to a feeling of weight and power. 91/Drinking window: 2016-2024. Open-knit yet deep and powerful, the 2005 Les Forts de Latour is striking today. The pedigree of the vintage comes through in spades. Expressive, perfumed aromatics meld into a core of supple, open-knit fruit in a mid-weight, impeccably balanced Forts de Latour. Hints of red fruit, iron, smoke and tobacco add lovely shades of nuance. Latour's President Frédéric Engerer adds that that 2005 was the easiest and most balanced growing season (including 2009 and 2010) he has seen because his team had the total flexibility of choosing when to harvest. 94/Drinking window: 2016-2025. One of the most pleasant surprises in this tasting, the 2002 Latour is just beginning to show the full breadth of its aromatic complexity, but it also has more than enough depth to drink well for several decades. Tar, graphite, incense and smoke open up in the glass in a Latour that leans towards the more delicate, feminine side of things. Silky tannins add polish and creaminess through to the finish. The 2002 is surprisingly delicious today for a young Latour, but it also has the pedigree and density to age nicely for decades. 96/Drinking window: 2016-2042. The 2001 Latour is magnificent. A huge, structured wine, the 2001 Latour boasts notable depth to match its vertical, towering structure and pure power. At nearly fifteen years of age, the 2001 remains deep, virile and imposing. With air, the 2001 is a approachable now, but ideally it needs at least a few more years in bottle. This is a superb showing by any measure. Frédéric Engerer adds that 2001 was the last vintage that was lightly filtered prior to bottling. 97+/Drinking window: 2021-2051. The 2000 Latour is an attractive wine, although I would have like to see a little more freshness, especially in the aromatics, for such a young Grand Vin. Round, creamy tannins give the 2000 much of its seamless, open-knit personality. Spice, leather, dark cherry and plum take on exotic shades of expression. With time in the glass, the 2000 turns a bit flabby. I can only suspect (and hope) this is less than a truly representative bottle. 94? /Drinking window: 2016-2036.